Technological advances have benefited our world in immeasurable ways, but there is an ominous flipside. Criminals are often the earliest and most innovative adopters of technology, and modern times have led to modern crimes. Today's criminals are stealing identities, draining online bank accounts, and wiping out computer servers. It's disturbingly easy to activate baby-cam monitors to spy on families, pacemakers can be hacked to deliver lethal jolts, and thieves are analyzing your social media in order to determine the best time for a home invasion. Meanwhile 3-D printers produce AK-47s, terrorists can download the recipe for the Ebola virus, and drug cartels are building drones. This is just the beginning of the tsunami of technological threats coming our way. In Future Crimes Marc Goodman rips open his database of hundreds of real cases to give us front-row access to these impending perils. Reading like a sci-fi thriller but based in startling fact, Goodman raises tough questions about the expanding role of technology in our lives. 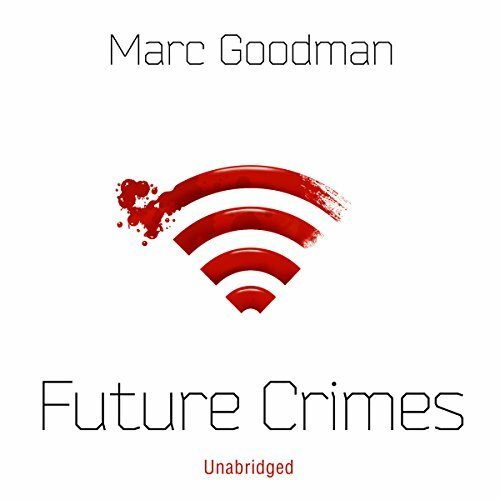 Future Crimes is a call to action for better security measures worldwide but, most importantly, will empower readers to protect themselves against these looming technological threats - before it's too late. I am in the security game and this was an education and eye opener as we focus on specialist areas. I will reread this soon. Comfortable listening with mind blowing facts. I would recommend this to all who want an understanding of today's technical social world. This book has changed how I think about the data I produce and the head in the sand naivety with which I have used free apps, websites, etc in the past. I will never submit any personal data on the Internet again.. Oh wait..
What did you like most about Future Crimes? a must read or listen put on your bucket list of things to do. it made me aware of things i thought i knew but i was wrong GREAT READ. What about Marc Goodman and Robertson Dean ’s performance did you like? If you use a computer listen to this. Often people take online security in the modern world for granted. This audio book gives a no-holds bared account of what will happen if we all don't act now. So listen, take not and act now. This book is an in depth look at the current state of cyber-security and technological crime more generally, followed by a view into the future of these topics. The author is an (ex?) police officer who is clearly an expert on the topic and has thoroughly researched the material - very little cybercrime related topics remain untouched. The first half (ish) of the book is taken up with what the state of the art is. This is terrifying and sometimes depressing as the author reels off vulnerability after vulnerability, crime after crime and (in many ways worse) violations by companies and states of people's privacy. I have to say that if you are interested in this topic you will probably know a fair amount of this already, but to have it collected in one place is great and also it's only once you hear it all together that you realise the scale of the challenge facing us. The second half of the book is the "Future" from the title. Starting with the implications of the Internet of Things, and then moving as far afield as synthetic biology, the author starts to look at what these technologies will do to crime moving forward. This section was interesting for sure, but given that it is essentially futurology a lot of it came off as just science fiction. Of course, how could anyone know? Either way, I was left very much hopeful that people in the right positions of power are paying attention because there is some seriously scary stuff around the corner! Thoroughly enjoyable, very nasty to contemplate some of it but has left me satisfied for sure. I have mixed feelings about this book. Nice chapters and subject however there are some blatant errors. His bio sounds impressive but he makes numerous incorrect statements when discussing the hacking components of the book. It reminds me of a law abiding strait teacher teaching 16 year old kids about drugs. He has evidently not been involved in the technical side of hacking and so makes mistakes in what hes talking about that those in the know roll their eyes when hearing. I found the reader was not the right choice, it made it sound like a very long Hollywood movie promo and i had to play at 125% speed to get it to what i feel a normal pace. A bit like being dragged out by your partner for a walk in the rain - not entirely un-pleasant and ultimately good for you but you wished you hadn't said yes. Some incredible information and startling revaltions. A long book which I persevered with in the hope I would enjoy it more but I didn't. It felt like the word count had been deliberately bolstered by the use of lists, many times a generic description would have sufficed; by the over use of figures, stats, metrics, percentages etc, the messages lost their value and meaning quite early on; I couldn't connect with the narrator's voice - can't put my finger on it so like my other comments are just my take. I found this a very interesting read. Much of what I thought I knew, I now I realize I don't. I will admit that I found it a bit long at 20hrs. Really struggled through the last four hours as I felt he was just trying to drive home his point that he already had many times in the book. None the a great a great read or ... Listen. This book shows the scary face of the darknet. It is a must read book. Alhough, the reality is really dark and scary most of the time; being aware does help out through our journey on the Internet. Good insights on to criminal minds with the new stuff in tech and how it gets used. I listened to about half and got bored. I have read\listened to countless other technology\ cyber crime titles and this one to me was repetitive and didnt grab me. I was dissapointed. What could Marc Goodman have done to make this a more enjoyable book for you? Unable to play it ... please fix!!!!! Unable to play it ... please fix!!!!! Unable to play it ... please fix!!!!! Unable to play it ... please fix!!!!! Humanity is doomed. Business and Government's inability to put security ahead of profit will dig our collective grave. As an ex IT professional, this book confirms all I have thought for years, and more. Everyone on the planet needs to read this. Quickly.